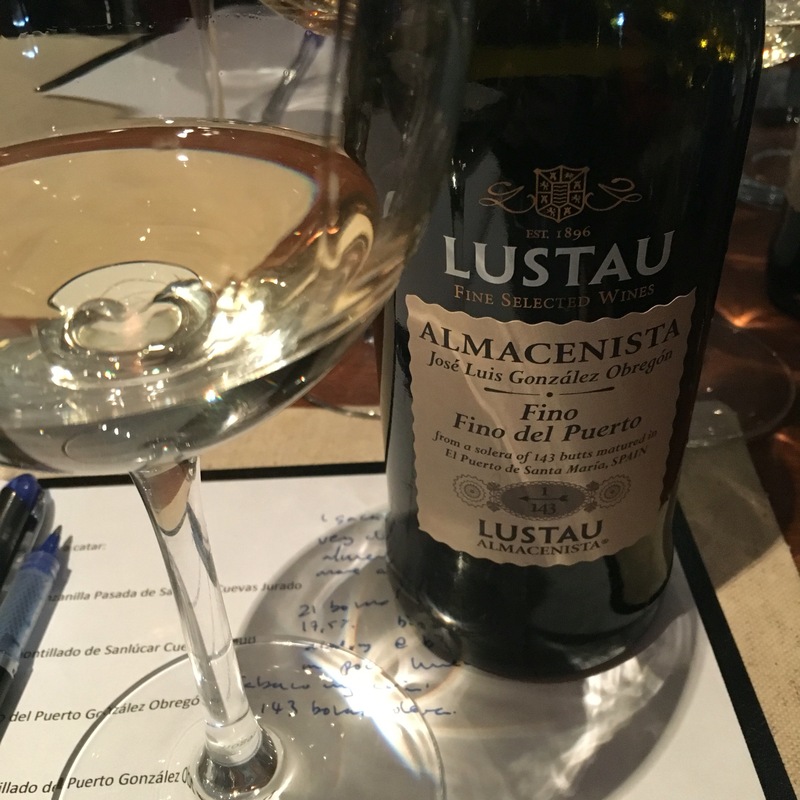 One of the great things about this Almacenistas range is the variety of styles – Lustau famously have bodegas in all three centres of the marco, and after two from Sanlucar it was time for a fino. I don’t need my notes to tell you this is a cracker. The yeast in the nose, raw macadamias and seaside aromas of low tide/rockpools. After the elegance that preceded it came across as a muscular nose, and big and full on the palate too. I remember getting back to it much later in the evening and noting it was one of those finos that you can drink after dinner. 5/4/2014 rated 94 points: N.V. Emilio Lustau (Almacenista) Jerez-Xérès-Sherry Palo Cortado Almacenista Vides 1/50 (Spain, Andalucía, Jerez-Xérès-Sherry); 19 pabv. T-cork. Double-decanted and allowed to open with cork in place for 24 hours. A nearly green tawny, clear to center but still powerfully colored. Delicate, high-toned dry figgy sweetness, leather and sweet smoke; caramel opening up to a sweetness not unlike dry maple syrup. Somewhat hot at first but fine palo, fresh but fine finish. Excellent, nearly classic. A rich, full-bodied, energetic wine with plenty of skin tang and tannins and great body. I’d estimate that this will improve another week or so with further airing and will plateau, from my experience, for several weeks. Will keep and improve in bottle unopened under t-cork for ten or more years. This wine is so tight and closed under its green robe that it needs quite a bit further aging before the typical palo cortado experience breaks through. edit…	2/16/2013 rated 93 points: NV Emilio Lustau as Almacenistas dealer (Jerez-Xérès) Sherry, Palo Cortado Vides, Jerez de Frontera, Spain.1 cask removed out of 50 from the Criadera. Warm brown-green to this color-deficient taster, with a very pale meniscus. Has a very simple, fresh, slightly woody nose. Chewing and slurping bring out some additional freshness and sappiness, with an energetic note and some length and refreshment. Now coming on with some nice depth and nice crispness. Decided to leave this in a decanter for a week or two, as it seems quite tight. Due to a question from a wine forum, I decided to re-taste this material 3/11/2013 at a cooler temperature. It was kept 24 hours in the refrigerator and tasted at 55 F (12C). The question: is the change I percieved occurring in this sherry due to a change in temperature? Fantastic stuff! You liked it then? No, I’m just enamored by it (smile)! Or should I say I’m enamored OF it, or WITH it. Yes, I like it.